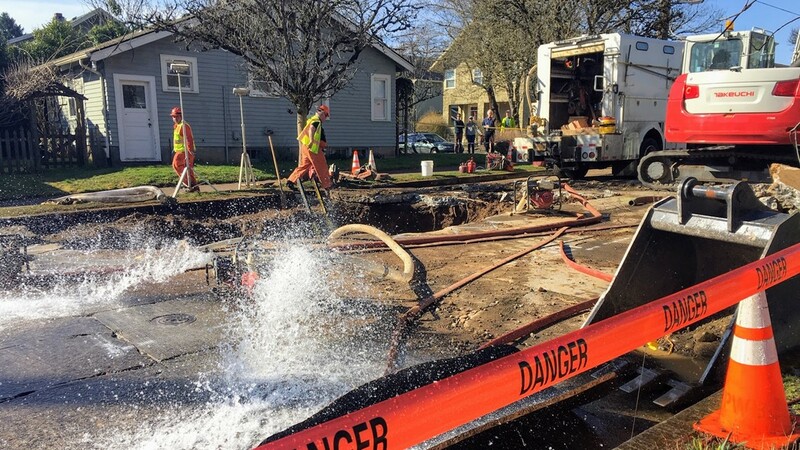 PORTLAND, Ore. — The 30-inch line that broke Saturday, sending millions of gallons of water into the streets in Northeast Portland, was more than 100 years old, the Portland Bureau of Transportation reported. Crews spent the day Sunday replacing the water main and cleaning up debris in the streets. PBOT also brought in vacuum trucks to clear storm drains and sewer lines so that the stormwater system is clear and ready for any rain in the coming weeks. Northeast Skidmore Street will remain closed between 22nd and 25th Avenue for 1-2 weeks as crews rebuild the road after replacing the water main. Only local access will be allowed, PBOT said. Clean-up was also underway for dozens of homes and businesses. More than a dozen homes and businesses had to be evacuated Saturday as water flowed into sidewalks and homes. Crews worked Saturday night and into Sunday morning to reduce water flow from the break. The Portland Water Bureau said tap water poses no health risks. AJ Kleffner and his wife were at a birthday party Saturday when they got a call from their neighbor to come home. "It was literally a waterfall down the driveway," said Kleffner. The father of two showed us cell phone video of thousands of gallons of water pouring into the driveway and into his garage and basement. He said he's already been contacted by the City of Portland about paying for damages. Over 10,000 customers were without power most of Saturday including dozens of businesses on Alberta. About 10 customers had water-related damage to their equipment that prevented service restoration. Customers with damaged equipment will need to consult a private electrician before the company can restore service. Any customer without damaged equipment, but still without power should call the company's outage line at 1-877-508-5088. However, Thomas O'Leary, owner of TC O'Leary's Pub, said the water didn't dampen spirits for the Saint Patrick's Day weekend. "Whiskey is in bottles, so that's not a problem. So, come down to O'Leary's, the water won't stop us today," O'Leary said. FRANKLIN, Ky. (WBKO) -- The rain has stopped outside, but now, it's time for crews to assess flood damage inside people's homes and businesses as water levels continue to rise. "Over the last couple of weeks with the amount of rain, we've probably been on 20-30 calls of flooded crawl spaces or flooded basements or just water getting into homes," said Jonathan Britt, Commercial Project Manager with SERVPRO. The Simpson County Extension Services Office on North Main Street in Franklin is unfortunately one of those basements with about 4 inches of water taking over. "I've been here 19 years and we've never had our whole basement flooded," said Catherine Webster, 4-H Youth Development Agent for Simpson County. She said the building is used as an office space upstairs, and the basement (which is now flooded) is where several local clubs and organizations hold their meetings. "We weren't anticipating not being able to use our downstairs space and that's all of our storage, too," she added. For now, those meetings are being relocated to other buildings in the county. Webster said those locations will be updated on the Simpson County Extension Services Facebook page. In the meantime, SERVPRO crews are working to remove the water from the basement and sanitize the area. "You need to get the water out immediately," said Britt. "It does carry a little bit of bacteria that you may not think could be dangerous to you or your family but that bacteria could make somebody pretty sick," he added. Crews are also removing saturated baseboards, as every room in the basement is filled with floodwater about ankle-deep. "You don't want to leave wood or insulation wet or drywall wet or anything else," he said. "Typically in these situations you are going to get a whole basement situation because the water doesn't have anywhere to go." By the end of the day Tuesday, the Extension Office expects to learn what has to be replaced, repaired, and when they can open the basement back up for meetings. Webster said thankfully, they do have flood insurance. Britt said he expects to receive more calls in the coming days, before the flood waters are gone. He said if you notice water inside your home or business, it's best to get it seen about as soon as possible because leaving it there can cause long-term damage. Molly Otis, owner of the former Tony Wise residence, located at the corner of Kansas Avenue and Second Street near downtown Hayward, is not going to let it become a parking lot, as many have suggested she should do. It seems the historic house in which Tony Wise was born in 1921 and died in 1995 has many lives, and it's not going away under her watch. Tony Wise sits next to the fireplace in the living room of the home in which he spent most of his life. Molly Otis is now working to ensure that this building has a future. . Wise was Hayward's iconic entrepreneur who changed the landscape of the area with his genius, invention and the development of Telemark Resort, Historyland and the American Birkebeiner. He also served as a captain in the U.S. Army's First Armored Division in Europe in World War II and was instrumental in bringing the National Guard to Hayward. The house originally belonged to the secretary of the North Wisconsin Lumber Company, managed by Robert McCormick, who lived in a mansion across Fourth Street from Shue's Pond. Hayward native Tony Wise was the founder of Telemark Resort. And Historyland. And the Lumberjack World Championships. And the American Birkebeiner. Otis told the Record this week she found the strength and time this summer to address the condition and future of the house. She called in historic preservationist Will Bay, who has worked throughout the United States reclaiming buildings and complete neighborhoods to historically accurate status, among them the 1885 Wilmarth Mansion, one of Ashland's showcase buildings. Otis said she and her former husband, Fred Scheer, purchased the house in the mid-'90s. "It was his project and he brought the house up to its present form as a rental. He did a great job and had much vision and belief in Hayward. I think all I did at the time was pick the exterior paint colors," she said. Since then the house has served many uses. From 1995 to 1999 it housed Johnson Insurance; from 1991 to 2001 it was rented to small businesses; from 2001 to 2007 it was the popular Madeline's Café, owned and operated by Otis herself; from 2007 to 2010 it harbored a mixed use of short-term rentals and apartments; and from 2010 to 2013 it housed a legal business and apartments. It has stood empty since 2013, with much nostalgia and speculation about its past and future. Otis said this last go-round with the house has been a challenge. "During that very cold winter of 2013 a number of water pipes burst. It was about the same time my husband (Glenn Stoddard) became ill. I just didn't have the drive, resources or energy to deal with that on top of our personal challenges. The house languished. Regrettably, the house suffered," Otis said. This past summer, Otis mustered the will to address the issue of the house. Bay came to Hayward and studied the house and its issues. "He was charmed by the design and assured me it looked worse than it is," Otis said, adding that he developed a plan to "make the house healthy." The plan is in action now, the last six months spent in mold remediation and water damage restoration, along with many structural improvements. In fact, Otis said the deconstruction phase of cleanup is complete and the reconstruction phase has begun. It will be "a respectful renovation with a bold focus on the future," she explained, adding this will be the third renovation she's completed on the house. Otis said right now, with the help of Bay and Jeff Deidrich, they are completing the upstairs apartment that has added numerous improvements and updates to the floor plan. Next week a furnace goes in and the painting will begin. Otis plans to move in for the major renovation and set up a studio space to work downstairs during the main level renovation. "I work best when I'm in the middle of the chaos," she said. One of the main attractions of the house is the basement, constructed of a gorgeous brownstone. Otis said years ago she considered that space when she opened her Wine Cave business, but the location of her Main Street building offered a better site. She now plans to rebuild the basement and develop the rear of the house, along with a commercial lot-and-a-half that is considered prime real estate. While she can't offer specifics yet as to exactly how things will look when completed and what it will be used for, since there is legal work and permits yet to be dealt with, Otis said she is open to all ideas at this point. "I am a slow moving bulldozer. I will cobble away at this place for the next few years and bring it back to life. I believe it's part of Hayward's history. I intend on it becoming a jewel of Hayward," she said. You are subscribed to email updates from &quot;basement water damage restoration&quot; - Google News.